A unique apartment complex is being envisioned for the community of St-Norbert, on the corner of Pembina Highway and Ducharme Avenue, which will contribute to our densification strategy for St-Norbert and enhance the viability of local businesses. Entreprises Riel has worked alongside the area Councillor and the developers to help guide the design. 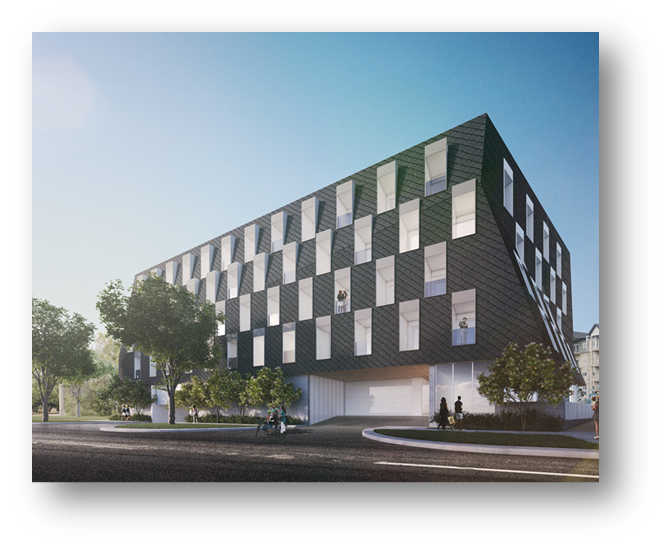 With the direction of the Planned Development Overlay and the design guidelines which we helped deliver for St-Norbert, the architects have imagined a style that can best be described as Nouveau Parisien. The concept gets inspiration from the Mansard roof styles found on many heritage buildings in St-Norbert. This six-storey 40-unit apartment has received the blessing of the community and is going through its due diligence process, demolition of the existing buildings has begun and it is expected to break ground soon.